Dubai: Residents gathered on Thursday for one minute of silence to honour the fallen heroes of the country in a solemn ceremony observed in all corners of the UAE. 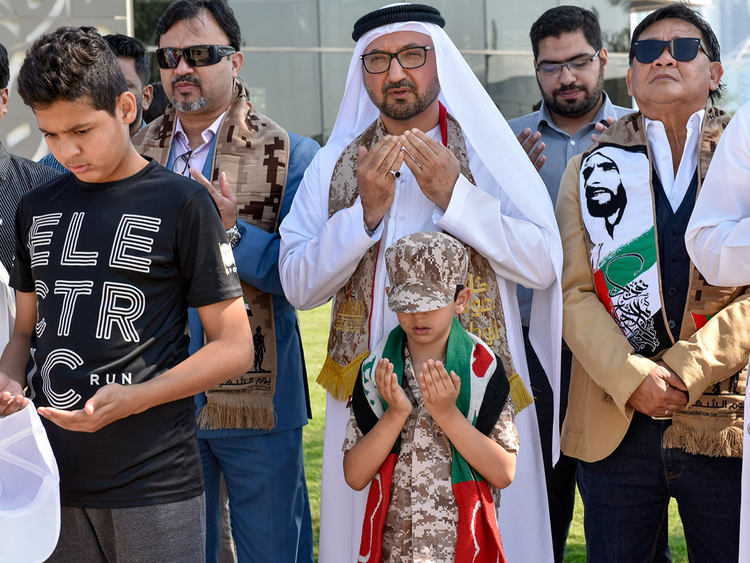 Prayers were offered in the silent vigil to honour the sacrifices made by UAE soldiers who were remembered as part of the country’s annual Commemoration Day. Government and private institutions marked the official remembrance ceremony beginning at 8am when flags were lowered, followed by a silent prayer at 11.30am. The UAE flags were raised again at 11.31am as the national anthem was played in the background. The occasion, which was first announced in 2015 following a decree by President His Highness Shaikh Khalifa Bin Zayed Al Nahyan, was marked on November 29 this year, one day earlier than its official date, since November 30 falls on a Friday this year. The day is observed to salute the martyrdom of Emirati heroes who sacrificed their lives defending the sovereignty of the nation in civil, military and humanitarian services. On Thursday morning, His Highness Shaikh Mohammad Bin Rashid Al Maktoum, Vice-President and Prime Minister of the UAE and Ruler of Dubai, and His Highness Shaikh Mohammad Bin Zayed Al Nahyan, Crown Prince of Abu Dhabi and Deputy Supreme Commander of the UAE Armed Forces, along with other UAE Rulers, paid their respect to the UAE martyrs at the Wahat Al Karama in Abu Dhabi, on the occasion of the Commemoration Day. Abu Dhabi corniche also saw people of various nationalities standing side by side with the UAE people in observing the one-minute silent prayer as the flag flew at half-mast. Similarly, in Sharjah, a number of government employees gathered at Sharjah’s Flag Island to pay respect for the UAE’s martyrs on the occasion. The UAE flag was hoisted at half-mast at 8am on the island’s 123-metre-high pole, considered to be the seventh highest flagpole in the world. Gulf News also held a commemorative event at its headquarters to pay tribute to the martyrs.